Assembly Rooms Edinburgh is to host a reimagined Alternative Peers Ball on Saturday 25 November to celebrate its 230th anniversary, with indie band Django Django announced as the headlining act. The Alternative Peers Ball event, which is based on the prestigious Peers Ball presented by Sir Walter Scott in 1822, hopes to attract music fans from around the country with a chockfull 5-hour contemporary line-up presented by Vic Galloway. 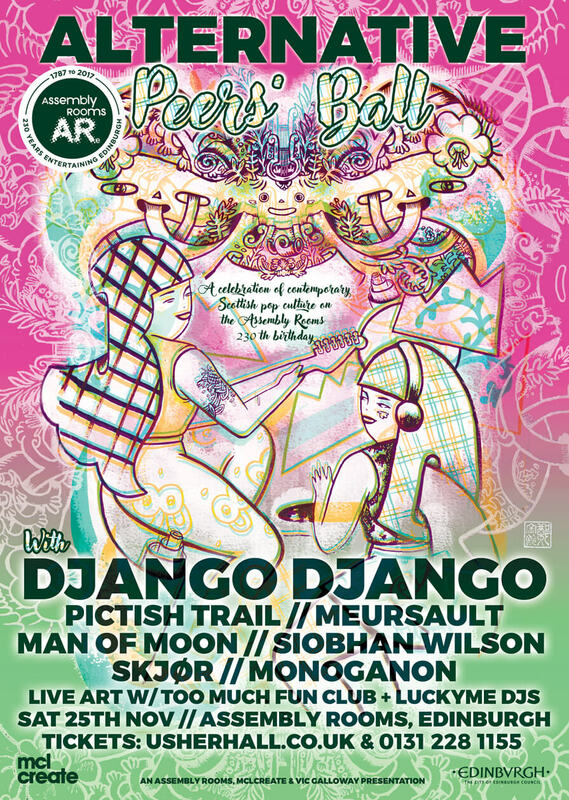 The evening will feature performances by Pictish Trail, Meursault, Man of Moon, Siobhan Wilon, SKJØR & Monoganon, as well as a DJ set from Edinburgh’s LuckyMe Records and live art by Ursula Cheng, Too Much Fun Club, Donald Watson and Projector Club. Just as with the pivotal 19th century event, the inaugural Alternative Peers Ball is set to make history by welcoming 900 partygoers to the George Street venue in a celebration of its 230th anniversary. With some of Scotland’s top artistic talents involved, guests can expect part-music festival, part art-installation and one of the year’s best parties. Tickets are on sale now via the Usher Hall website or by calling on 0131 228 1155. Over 18’s only, doors open at 6pm.